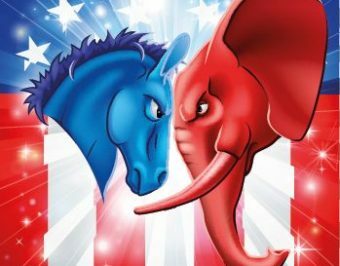 So ubiquitous in today’s political discourse, many assume that the red state/blue state distinction has been around as long as we have had Republicans and Democrats. In fact, the opposite is true – the dichotomy is relatively young, having only become settled with the Presidential election of 2000. In order to make political reporting more interesting, and to help viewers more easily discern the leanings of a particular party, colors are often assigned according to the party’s ideology. Because of its association with Mussolini’s Camicie Nere (Blackshirts) as well as Hitler’s Schutzstaffel (SS), internationally black typically designates a fascist or anarchic party. In the 1960s and 70s in the U.S., however, the socialist Black Panther Party (BPP) adopted black for its color. Unlike in the USA, conservative parties internationally are typically identified with blue. This tradition is reputed to have begun in Great Britain where the Tories adopted blue as their color circa 1900 in response to Labour’s use of red. In the Muslim world, because green was Mohammed’s favorite color, it is frequently adopted by Islamist political parties. Hamas, the Kingdom of Saudi Arabia and the Islamic Republic of Iran all use green on their flags. In other places, particular Western Europe and the Americas, green is used to designate environmental parties, such as the Green Party of the United States. Consistent with international usage, until quite recently conservative groups in the United States were affiliated with blue, and left-leaning groups were designated red. So well-accepted were these denominations that following the Bolshevik Russian Revolution of 1917, and then again during the 1950s when Senator Joseph McCarthy conducted a witch hunt against supposed American communists, these events were known as the 1st and 2nd Red Scare– times when the “right” were “scared out of their wits”, according to two time Pulitzer Prize winner Walter Lippmann (who incidentally was the first to outline the concept of the “Cold War”, as well as introduced the modern psychological definition of “stereotype”, which previous to his usage was primarily a printing press term for a duplicating printing plate). For years, both parties would do red and blue maps, but they always made the other guys red . . . . During the Cold War, who wanted to be red? Things began to change when the ability of news outlets to display graphical information leapt forward in the 1970s. When reporting the results of the Presidential election of 1976, Time magazine’s electoral map designated states won by Republican Gerald Ford as white and those won by Democrat Jimmy Carter as red; however, for the next election (1980), Time’s editors had switched the colors, such that states won by the Democratic incumbent were white and those won by Republican Ronald Regan were red. Presumably, the more vibrant color was intended to identify the winner of the election, rather than its ideology. For its coverage of the 1980 Presidential election, NBC’s broadcast included an electoral map that designated states carried by the Republican candidate as blue and those won by the Democrat as red. Anchor David Brinkley described Reagan’s landslide victory of that year by referencing the graphic: “It’s beginning to look like a suburban swimming pool.” NBC maintained these colors for the respective parties until the Presidential election of 2000. The Presidential election of 2000 was a doozy. Like the recent contest of 2012, the country was nearly evenly divided in the popular vote, and prognosticators were all over the map with their predictions. Political coverage leading up to the election dominated both broadcast and cable news. By this election, NBC had settled on blue to represent states won by Democrats and red to designate those won by Republicans. Tim Russert (the popular and respected moderator of Meet the Press) regularly appeared on NBC’s then top-rated Today show to analyze the contest; it is rumored that he coined the terms “red state” and “blue state” on its October 30 broadcast. Coverage continued unabated through the election on November 7, and that’s when things really got interesting. The race was too close to call, particularly in Florida. The Sunshine State’s 25 electoral votes would put either candidate over the 270 threshold needed to win the Presidency. Because the candidates were separated by merely 900 votes on the first count, a mandatory recount was ordered, which became a hand count in four counties. While we obsessed over hanging chads, the electoral system and Katherine Harris, television broadcasters repeated the red state, blue state mantra ad nauseum. By the time the Supreme Court crowned George W. Bush the 43rd President of the United States on December 12, 2000, in Bush v. Gore, the dichotomy was ingrained in the American psyche. Next you might look at ‘pink for girls, blue for boys’, also a recent convention that’s changed considerably over time. So which party is red and which one is blue again…? 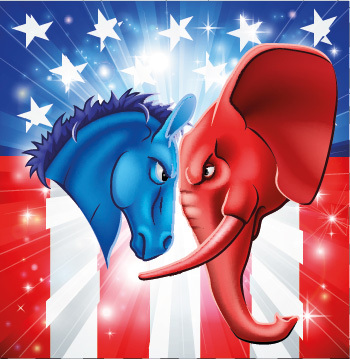 In the U.S., it is Republicans red, Democrats blue. Total bs, the left leaning media realized they had a branding problem as Clinton was running for bush 1’s seat. They made a conscious decision to act as if they had always referred to left parties as blue… But because they did not hold sway Internationally… We get this propoganda that it was somehow a natural transition… Total bs but the history books will state it just like this lame excuse for journalism. It makes more sense that the Democrats should be red, considering that they are closer to socialism and communism, and that EVERY OTHER LEFT-LEANING PARTY in Europe uses red. The Labor Party in Britain uses red while the Conservatives use Blue, and the left-leaning SPD in Germany uses red while the “conservative” CDU uses blue. This was quite a coup by the Liberal Media to disassociate the Democrats with red. I’ve believed since this standardization started in 2000 that the MSM (left leaning) assigned red to the GOP because red = enemy in a military context (red graphics, enemy countries called “Redland”, etc.). The change began in 1984 and was complete by 2000. Maybe Nancy Reagan’s color choice had something to do with this. The left leaning media decided to change it because they got sick and tired of republicans using the phrase “better dead than red.” It is as simple as that.